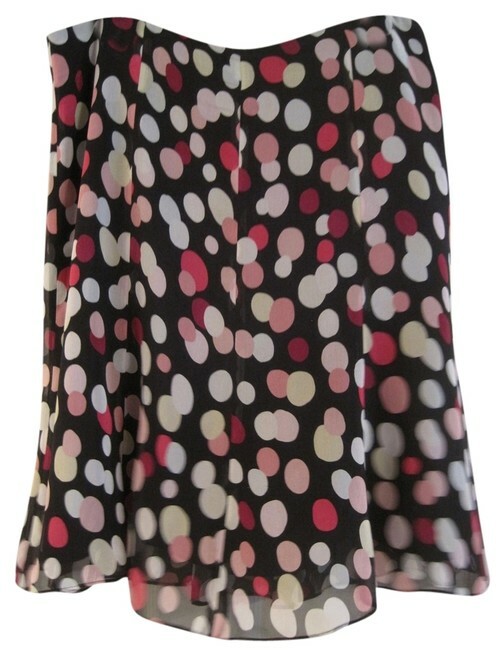 EXPRESS BLACK SILK SKIRT WITH POLKA DOTS SIZE 10. BACK ZIPPER. 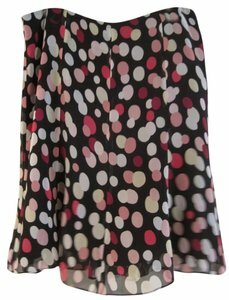 POLKA DOTS ARE WHITE, LIGHT PINK, PINK, YELLOW AND HOT PINK. VERY FLOWY. 100% SILK. WITH SILK MATERIAL YOU CAN HAVE SOME PULLS AND I NOTICED A COUPLE. NOT NOTICEABLE (HAD TO SEARCH FOR THEM) BUT I WANTED TO NOTE IT. DOES NOT TAKE AWAY FROM THE LOOK OF THE SKIRT. APPROXIMATE MEASUREMENTS WAIST 34" AND LENGTH 22". LINED. COMES FROM A SMOKE AND PET FREE HOME! PLEASE LET ME KNOW IF YOU HAVE ANY QUESTIONS.THANK YOU FOR LOOKING!